I read how many of the young people who have BA can't live like their peers around the world. Try to live with $ 216 knowing that you may not get paid next month or there is a bigger chance that dollar price will go higher and you will be having less purchasing power. It's Iran today. I think the Iranian regime should not underestimate the protestors or the oil workers. While they claim the protests are over, I'm guessing the unhappy people are still unhappy. Isolating nations only empowers negativity. I believe how are people from Iran unhappy last 20 years. But, regime still exist. Doesn't exist a critical number of "unhappy people" needed for change. I found an interesting comparison. Khamenei is a megalomaniac. There is the natural desire of the megalomaniac to hang on to power until the last possible minute and not to take the slightest risk of losing it. He has no support at home, but has power and QODS. Generally, people in Iran lives without elementary human rights, enough money for a normal life, freedom of speach, free medias, etc... In my opinion main demand is “Khamenee Let go of Iran”. People after nearly 40 years don't want this brutal regime. Usual command economy issues, high youth unemployment, especially amongst women, and subsidies on food and fuel being withdrawn for the poor... No doubt, this is to long process for Iranians and regime and clerical elite can't survive. Now, time is not ally, but that day will come. Iran was spending more money on wars (Syria, Iraq, Lebanon, Yemen) and supporting terrorist groups than on own people. The beginning of an end....who knows? 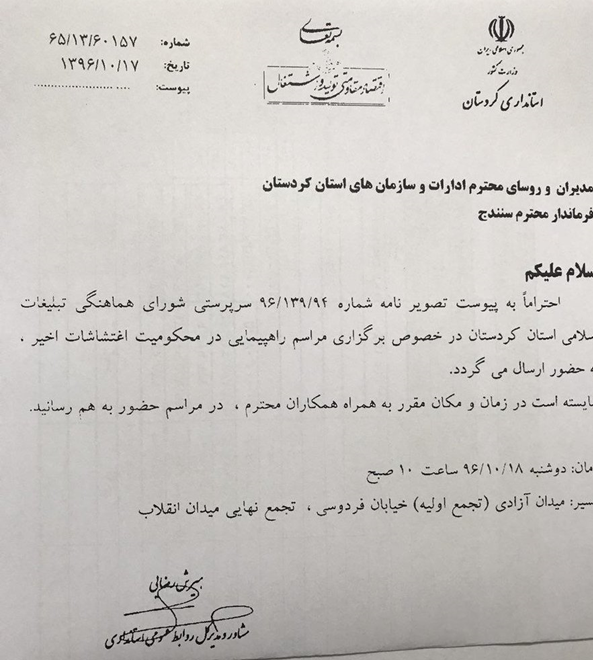 While Rouhani spoke about democracy, regime has ordered all governmental staff and their first degree family members to take part in the propaganda rallies against Iran Protesters .They are threatened to participate, if they don't they will lose their jobs. Someone put this document. Is this surprising for someone? 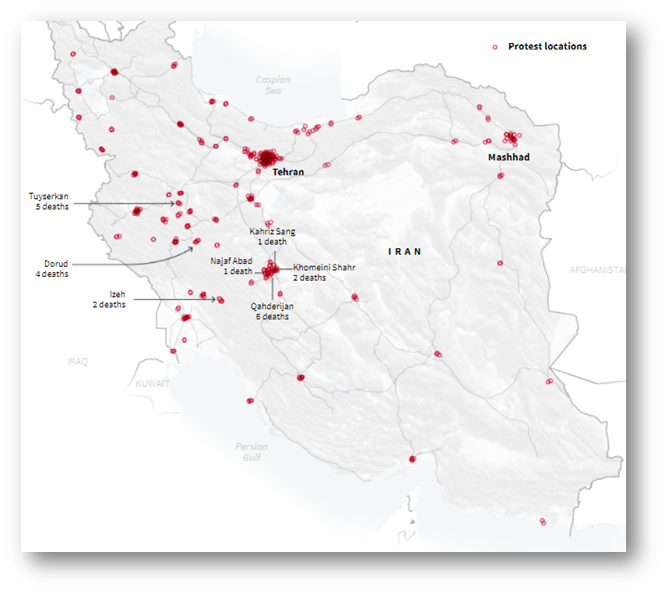 The one thing that surprises me is that the Iranian regime's threat is limited to job loss. This could be very interesting. History is so important in Iranian civilization and as we know, they were cradle of civilization... But, coincidentally, I found something what is important for today date, and it's in connection with Iran history. "On January 8th 1936 the Iranian King RezaShah the father of modern Iran and the arch-enemy of the islamic clerics, banned the hijab for all women in Iran. Queen Mother, Taj-ol-Moluk Ayrom-lou (his wife) was the first women to lead by example.."
Now and last 40 years in Iran, the mullahs have declared every woman as being equal to two men..... Why, just they know. I hope he will be better for his country than his father was, in the end. That’s how the Ayatollahs gained political influence in the first place. It wasn't be perfect political system, but it was plural society. After that (1979) - dark. I agree with you Pav. If the people of Iran are successful and remove this murderous regime, Iran will never allow this to happen again. I hope anyway. The pendulum went too far. Some of the Iranians have sent this message: "The regime will fall only if these companies pull out. Call on these companies CEO to stop empowering the regime!" Every action has got a reaction...as newton said. Everybody saw the action in country... now people waiting for the reaction and world must have same approach..